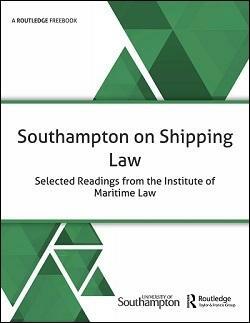 Southampton on Shipping Law: Selected Readings from the Institute of Maritime Law is a FreeBook brought to you by Informa Law from Routledge. It contains a collection of curated content from some of our recent titles written by experts at the Institute of Maritime Law. Informa Law from Routledge is proud of its long-standing relationship with the Institute of Maritime Law (IML) at the University of Southampton and the many exceptional contributions to the shipping law literature itsmembers have made through one of our publications.The most notable of these is,of course, Maritime Law, now in its fourth edition, and featuring contributions from a wealth of IML staff. Outside of that seminal textbook, members of the IML publish regularly in books and journals,a small selection of which is presented here, and all of which are available to purchase online. With a reputation stretching across the world, this collection of chapters from recent IML-authored books should prove attractive to maritime lawyers, academics, students, law associations, and many other international organisations. Topics covered in this text include the laws of yachting, registration of yachts, the Hague and Hague-Visby Rules, public international law aspects of shipping regulations, and more! Informa Law from Routledge provide professionals with high-quality, expert books across a wide range of areas including Maritime, Commercial, Dispute Resolution, Construction, Insurance and Transport Law. Written by eminent lawyers and industry experts, these books are essential reading for practitioners.